HarperCollins started life in 1819, as Collins Publishing in Scotland. The company focused on bible printing in the mid- 1800's. It was renamed William Collins, Sons and Co. Ltd in 1868, and was an early publisher of the works of Agatha Christie and C.S. Lewis. 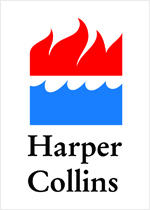 The "Collins" was joined with the "Harper" in 1989, when it was purchased by the Ruper Murdoch Publishing Group, and joined with publisher Harper & Row. Today HarperCollins is a giant of the publishing world, supporting many award- winning SF/F authors.